Ronn's Minor League Hockey Mania: Orlando Solar Bears are Back! Orlando Solar Bears are Back! I am pretty excited to see another former IHL team hitting the ice next season. 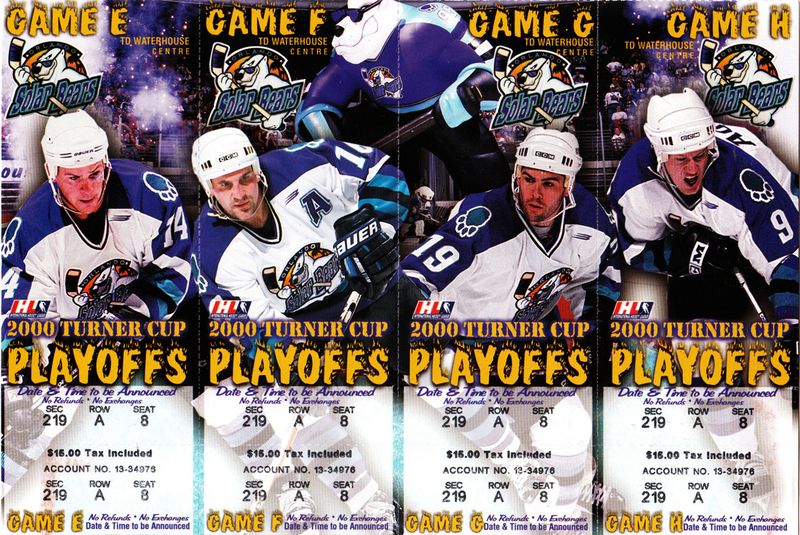 Back in 2000, the Orlando Solar Bears won the final IHL Turner Cup before the league folded, with 6 of its teams continuing on to play in the AHL. I can't wait to see what their updated logo looks like once it is unveiled. Below is the press release announcing the team. City of Orlando Welcomes Home the Orlando Solar Bears. When the Orlando Solar Bears last skated off the ice 10 years ago, they carried the IHL’s final Turner Cup. Today owners of the Orlando ECHL team (Joe Haleski, Jason Siegel and Bob Ohrablo) were joined by City of Orlando Mayor Buddy Dyer, Orlando Magic President Alex Martins, Executive Director of Orlando Venues Allen Johnson, and ECHL Commissioner Brian McKenna, to announce that the team will be named the Orlando Solar Bears. The Orlando Solar Bears, owned by RDV Sports, competed in the International Hockey League from 1995-2001. In their six seasons, the Solar Bears won three Conference Championships and in 2000-2001 won the IHL championship trophy – the Turner Cup. It was the last Turner Cup ever awarded. "On behalf of the Orlando Magic family, we welcome Orlando Pro Hockey to Central Florida. We are excited that we have formed a partnership with Orlando Pro Hockey that will enable them to revive the tradition of pro hockey established here by our organization in the past,” remarked Orlando Magic President Alex Martins. The Orlando Solar Bears will begin play at the Amway Center in October 2012. Fans will be able to obtain ticket plan information by by filling out the form to the right. Season tickets plans will range in price from $195-$1350 per season seat. Full and half season ticket plans will be available. The team will unveil its’ team logos and jersey designs, announce its NHL and AHL affiliations, and introduce its coaching staff over the next 6-8 months. The team has retained The Joe Bosack Graphic Design Company (joebosack.com) to design its primary and secondary logos along with new jersey designs and wordmarks. Joe Bosack designed the Colorado Avalanche logo and a number of current ECHL team marks.